Here are 5 of the most sought after used Whittley boats on the market. 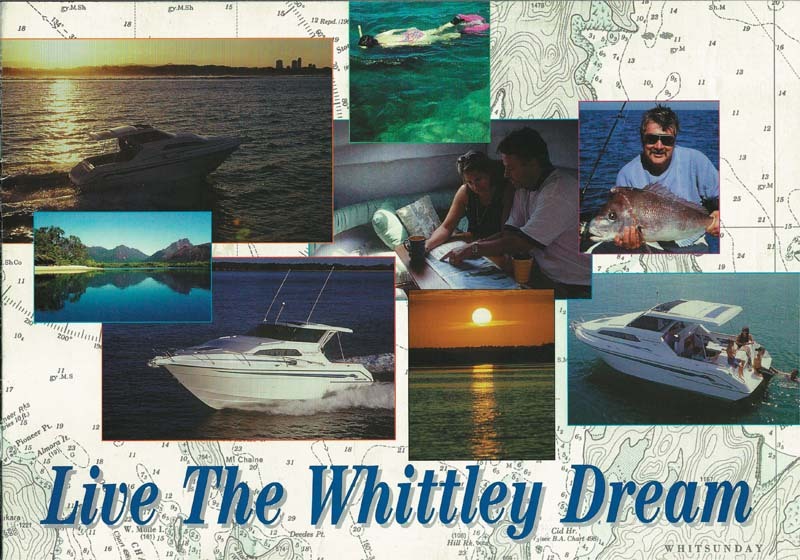 Whittley boats has consistently remained one of the most popular and enduring boat brands in the Australian fibreglass boat market. In its 60+ year history, the Whittley name has appeared one some genuine classic Aussie trailerboats. Here are five of the most sought after used Whittley boats that regularly make it onto the used boats market. 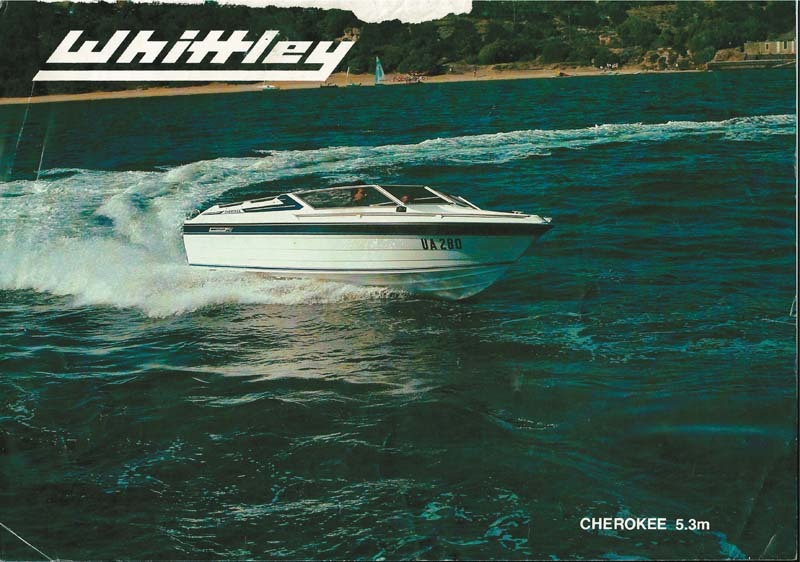 If there was ever an Australian fibreglass boat of the ’70s and ’80s, it had to be the Whittley Cherokee. There was nothing on the market like this boat, which was possibly the first true "crossover" boat — combining a luxury fitout with sporty runabout styling and a saltwater-capable hull. The Whittley Cherokee may have shared a hull with the Impala Cruiser, but it had a totally different demeanour and different handling characteristics. She rode a little bit hard into the chop, with the seating pushed forward to give plenty of deck space for fishing and waterskiing. The Whittley Cherokee was 5.3m long with a 2.15m beam, with a beautiful internal fitout with fibreglass liner incorporating suede-upholstered back-to-back seating and moulded rear seating that could accommodate up to six people. These boats were commonly fitted with the first of the new Mercury "Black Max" 135hp and 150hp 2L V6 engines. However, MerCruiser, Volvo and OMC options were also available. The Whittley Cherokee’s decks were characterised by the long coaming that extended from the four-piece windscreen all the way to the transom. It had striking mouldings and offset trims on the top coamings, offset by just a touch of timber trim. It did have a supposed "walkthrough" hatch at the bow, but you really had to be a contortionist to walk through it. The low-profile deck was matched by a similarly low-profile hull. When we look back at the very short little canopy now we may laugh, but it was cool in its day. According to Steve Whittley, "Nothing’s been close to the success of the Voyager." 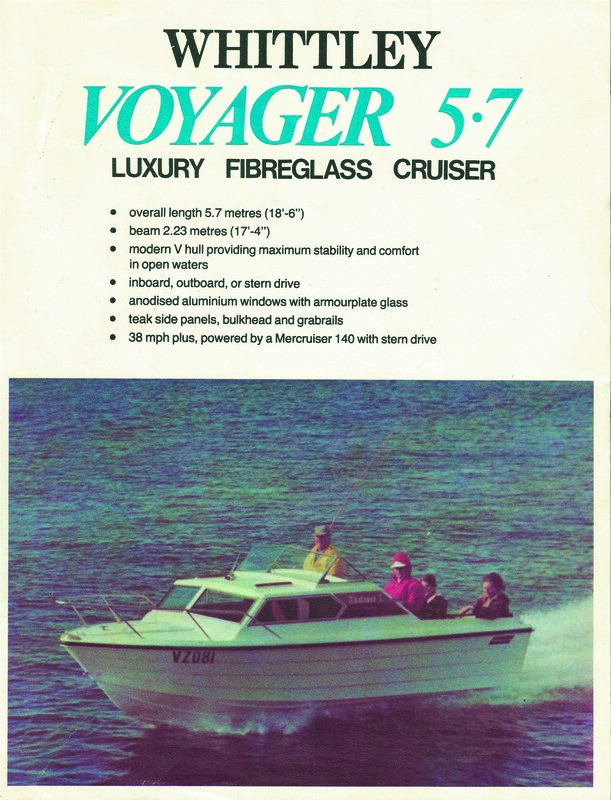 The original Whittley Voyager MKI was one of the most innovative boats of the Australian marine industry. It evolved from lessons learnt in the timber cruising range, but was made from the time’s new "wonder material", fibreglass. It included all of the traditional Whittley boat flair, and added a bit more. There was a timber bulkhead with a louvered door forming a lockable vee-berth and cabinetry. It had moulded rear seating, plus pedestals or boxes, sliding safety-glass windows and even an option for a full-length hardtop. The design brief was simple: the Whittley Voyager had to be reasonably priced, towable behind the family six-cylinder Ford or Holden, have room for the family and be stored in an AV Jennings garage. The original Whittley Voyager was a 5.7m clinker-sided hull with a 2.23m beam, 19° deadrise and a moderate vee. It was available with a MerCruiser 140hp or Volvo 130hp sterndrive or an outboard motor as standard. The Whittley Voyager hull then evolved into a 5.3m vessel with a 2.2m beam and 18° deadrise, before becoming the Voyager 580 in the mid-90s. The Voyager’s modern equivalent is the Whittley 2180 Cruiser, which offers a sensational layout for a trailerable pocket cruiser. 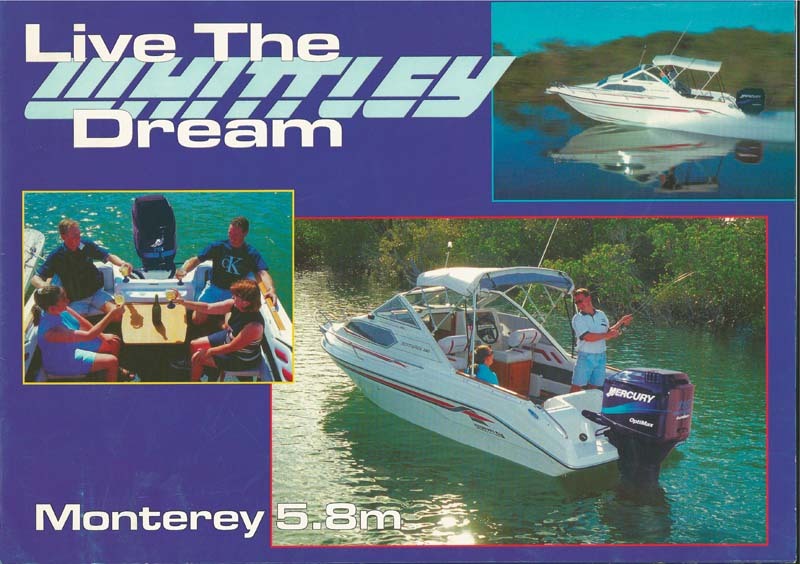 The Whittley Monterey took out the 1994 AMIF Australian Boat of the Year Award by a country mile and was a milestone not only in the history of Whittley Boats, but for the entire Australian boating industry. A beautiful package, the Whittley Monterey 580 was the missing link between the older straight-laced timber cabin cruisers and more modern design and finishes. The boat proved fibreglass didn’t have to be square and boxy, with Whittley boats learned to use curvature to emphasise design flair. Upholstery moved from old-style carpets, terry towelling and suede into contemporary statements and waterproof construction. Moulded windscreens became an integral part of the construction and the combination of mouldings, two-tone colouring, timber trims and stylish decals brought a fresh face to the package. The number of fittings, facilities and comfort offered by the Whittley Monterey was only surpassed by the friendly and spacious layout, which included bedding for four people. The toilet in the vee-berth area could be enclosed by the bi-fold cabin doors and the seat boxes supported the sink, stove and catering units. The Whittley Monterey 580 was in fact only 5.8m in true length, but the addition of the integral moulded rear platform and bowsprit brought it to 6.4m overall, and it was loaded with storage and amenities. The boat was available in outboard motor and sterndrive configurations, but the V6 sterndrive units were particularly good on the water. The 5.8m was later updated to become the Whittley Monterey 600, continuing the success of a great Whittley boating package that embraced all of the advantages of a luxury mobile, trailerable cruiser. While it’s not a part of the original model line-up of the early days, the Whittley Sea Legend 650 borders on being a modern classic and its current SL 22 reincarnation has beautiful and timeless flowing lines. 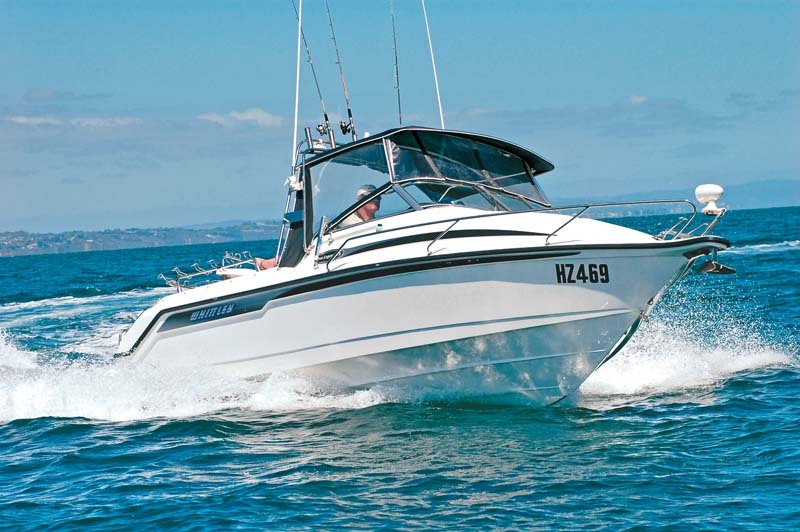 The layout is functional and resonates with anyone looking for a quality fibreglass fishing boat, along with favour among families and cruisers. It has all the bells and whistles, but is a mighty fine sea boat to boot. The transom and deck area is extremely fishable and the moulded back-to-back seating adds an element of comfort on long days in search of piscatorial prey. There is also a moulded boarding platform and a fold-down ladder for watersports, while the Whittley Sea Legend 650 really gets up and boogies with a very efficient hull capable of running up to 225hp in the outboard version. At 6.5m overall, including the bowsprit and platforms, and with a towing weight of less than 2000kg, the Whittley Sea Legend 650 is a very versatile package that can be towed by a reasonable family vehicle, yet has the offshore credentials to take you on a game fishing adventure. This Sea Legend certainly lives up to its name. Who can ever forget the Whittley Cruisemaster Sovereign 2300? This revised, highly-specced version of the original Cruisemaster had every boatie in the country longing for a ride. The Sovereign would have to be the iconic embodiment of a traditional cabin cruiser, fitted to an unprecedented level of comfort and refinement. People loved its style and grace, and geared up with F100s, Broncos and the like to tow it. We read back on some old boat tests and found a report by industry doyen Ron Calcutt, who remarked at the time (probably about 1980), "Boats like this give a whole new meaning to the term ‘made in Australia’." 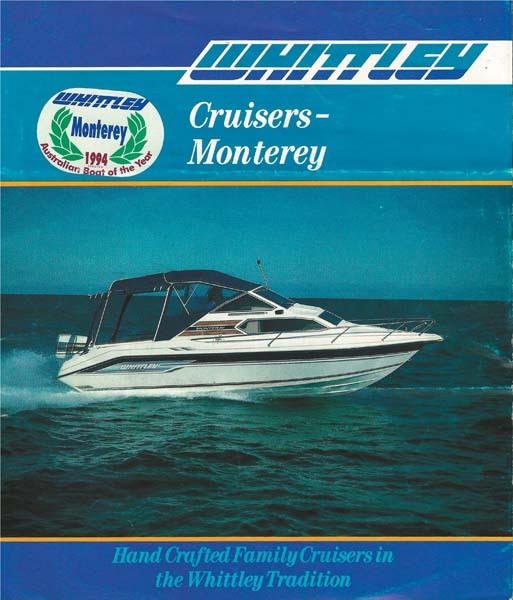 The Whittley Cruisemaster started life as a 660 and transformed into the 2300 before becoming the 700 model, and was mainly fitted with a MerCruiser 230hp 5L V8 that powered the big hull along beautifully. It had multi-level living zones, with a lower vee-berth, galley and bathroom rising to a dinette and entertainment area that flowed into the cockpit with its multifunctional box seating and large rear U-shaped lounge with drop-down table. It was an entertainer’s delight and it still has a strong following to this day. Originally published in TrailerBoat #296, June / July 2013. Why not subscribe today? Here are 8 of the most sought after used Cruise Craft boats on the market.